Current particle counting technology based on optical particle detection is inadequate to monitor particles at the line widths used in today’s semiconductor manufacturing facilities. The International Road Map for Devices and Systems (IRDS) roadmap for semiconductor manufacturing has needed sub-20 nm particle detection for several years. 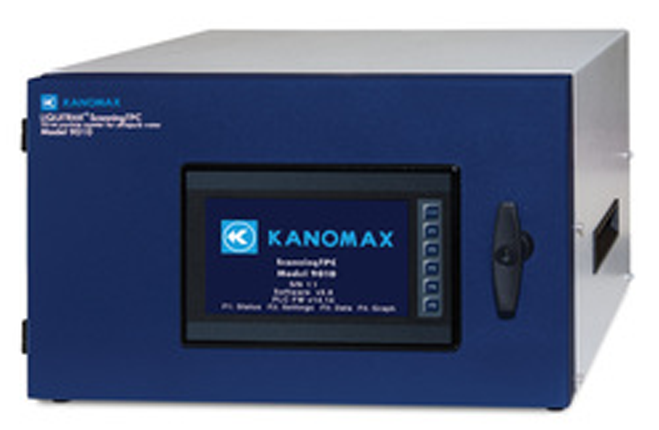 The ScanningTPC is the world’s first particle counter capable of detecting 10 nm particles in Ultrapure Water (UPW). In the ScanningTPC an ultra-fine nebulizer uses patented dual-sequential impactors to remove nearly all large droplets that might generate non-volatile residue particles of 10 nm diameter and larger. These large NVR particles interfere with the measurement of genuine particles in suspension. A patented size-selectable Condensation Particle Counter continuously scans particle sizes at 10 nm, 15 nm, and 20 nm with 50% detection efficiency. The response of the ScanningTPC is not dependent on particle refractive index or particle shape —unlike all Optical Particle Counter (OPC) or Laser Particle Counters (LPC) in use today. And also unlike all OPCs and LPCs the ScanningTPC does not use Polystyrene Latex (PSL) particles as a calibration material. The standard derivation for PSL particles < 40 nm becomes so large that they are almost unusable for the sizes measured by the ScanningTPC. Instead the ScanningTPC uses a variety of colloidal silicas traceable to the European Reference Materials colloidal silica standards. The ScanningTPC’s 50% detection efficiency at 10 nm allows particles as small as 7 nm to be counted. By contrast, the counting efficiency of OPCs and LPCs is only 3-5% at their rated particle detection size. As the ability of even the best filters to remove 10 nm and smaller particles drops dramatically, expect to see significant particle counts when using the ScanningTPC. Monitors particles ≥10 nm in real-time. Rapid response time to detect changes in particle contamination levels. The response is not dependent on particle refractive index or particle shape. Option to specify particle sizes for continuous (non-scanning) monitoring. Operates with either an in-house vacuum system or the internal pump. Portable and easy to set up. Robust with minimal maintenance requirements. Simple to operate using the intuitive front-panel-display menus.